We’ve been getting lots of questions about cat behavior lately and decided to share a Cat Behavior 101 Q & A with one reader’s question. 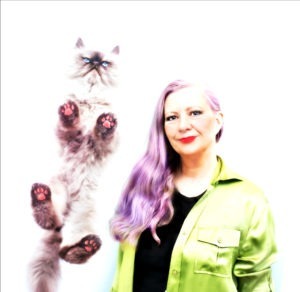 Have question for holistic cat behaviorist Layla Morgan Wilde? 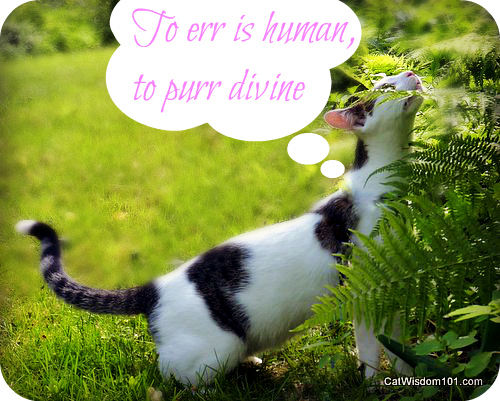 Send it to info@catwisdom101.com with Cat Behavior 101 in the subject line. Question: It’s a gorgeous day so I washed rugs and went outside to drape them over the deck railings. The back door was open. I wasn’t planning on being outside for very long. I draped my rugs, turned around to go inside and Pilchard came out of the house, slipped off the deck through a loose slat and went under the deck. She knows she’s not to do this. I stomped on the deck and yelled at her. Then I poured warm water over the deck in an effort to flush her out. She was flushed out but dashed around the house. I saw her turn the corner to pass in front of the house. I’ve got some overgrown bushes in the back and I hacked at those with the loppers. I lost track of her which is easy to do since she black. Hugely angry by now, I decide I’m slamming the back door to make a point and she can stay outside. She’ll get scared and maybe that will learn her. I come inside and she’s lying on the floor in the hall. I walked up to her and said in an angry voice, “You have made me very angry. You know what you did is wrong.” She jumped up, faced me and started growling and hissing, ears back, the whole angry cat thing. I strode forward, pointing at her and continuing my rant. She backed up, hissing, yeowling and growling. She fled into the home office under the cedar chest where she goes to hide during thunderstorms. I have decided to ignore her the rest of the day. She was on the table in my living room and I said to her, again, in not so kind words, “Move.” She growled and hissed at me. After all of this, my question is, how can you punish a cat for bad behavior? She knows she’s not allowed off the deck. I need to fix that slat so she can’t move it to slip through that location. Then she can’t get through the deck slats. But she knows. The other cat in the house knows not to get off the deck. She might tempt fate but I just have to say, “Mija! No!” and she comes back up onto the deck. I remember being told or reading somewhere that cats don’t have the kind of short term memory processes that dogs do. If a cat pees outside the box, rubbing their nose in it does nothing. I know you should never slap a cat because they will then associate your hand with punishment. But what can be done when a cat does something they know they aren’t to do? You can’t tell me they don’t know a behavior is wrong. Pilchard looked for me and then made a break for it. Answer: How do you punish a cat for bad behavior? The short answer is, you don’t. Cats don’t make judgements about good or bad behavior. As you’ve learned, punishing a cat doesn’t work. The only effective way to change behavior is to reward desired behavior and non-reward undesirable behavior. Cats respond to human emotions in the moment. If an angry human is chasing them, they’ll perceive it as a threat. In this case, she might have simply considered it a game until it got it out of hand. Cats seem to enjoy getting humans roiled up to test our boundaries but it’s mostly to get attention. So called unruly cats will act out but their only crime is needing more interactive play time with their pet parents. I’m convinced cats know what we’re thinking but scientists would disagree. It’s easy to project our own beliefs onto our cats when they don’t abide to our way of thinking. They can’t. They think like cats and for us to understand them, we need to think more like them. They live and adapt to our world which is very different than if they were allowed to live naturally in theirs. They aren’t pack animals like dogs who like to live in groups. Cats associate all experiences as either positive (pleasurable) or negative (painful or unpleasant). Studies show cats may live in the moment but their long term memory is sharp and based on negative or positive associations They will recognize people they haven’t seen in years or the reappearance of an stored away old cat carrier or garden hose might trigger a negative memory. The best way to get Pilchard to do what you want is to study her body language and respond to it. It looks like you already know many of her body language cues. She gave you fair warning not to come closer with a defensive sound and change in tail and ear positioning but you continued. It left her in position where she had to choose between fight or flight mode. She didn’t want to fight with you so she fled to a place where she’d feel secure. Humans will respond to violence, yelling, judging and withholding as a means of punishment but it doesn’t work well with humans and never works with cats. What works is to reward them with praise, attention, playing, petting, treats (whatever they like) when they do the behavior you want and NOT reward when they don’t. Gradually they associate the “good” behavior with good things. The most important thing is not to reward the behavior you don’t want. We can inadvertently reward by yelling and having a hissy fit which is easy to do when kitty has just broken your favorite vase or peed on your best shoes. Ignoring, not making a sound or walking away from a behavior you don’t want works as a non-reward. In your case, ignoring her was a good example of a non-reward until you approached her with a command in an angry tone. She responded defensively. A more effective approach would have been to approach her calmly and neutrally watching for her body language cues. If she was leaning towards friendly, I’d have rewarded her with soft praise and her favorite chin rub or treat. Yelling, slamming doors etc. will not work as a non-reward. Cats perceive it as getting attention = a good thing and the more you do it, the more they will continue the same behavior. It may seem counter-intuitive to be quiet when we want to yell but it works. Cats are constantly sending out feelers to gauge human moods. Cats do respond to apologies because as humans we make mistakes. It’s not the words but the feelings behind the words that gets transmitted. Why one cat responds to you while the other doesn’t is difficult to say except that no two cats are alike. [url=http://buypheromones.webs.com/]wingman x pheromones[/url] pheromones cats 8125 pheromones bugs [url=http://usepheromones.webs.com/]pheromonoes[/url] pheromones yeast pheromones yahoo [url=http://pheromone101.webs.com/]zombie pheromones[/url] pheromones human. 9107 pheromones cats calming [url=http://pheromone101.webs.com/]pheromones psychology[/url] dgrg0y, 5657 pheromonoes [url=http://buypheromones.webs.com/]pheromones women[/url] jaf2a0zqzlezdkj, pheromones job interview [url=http://usepheromones.webs.com/]pheromonoes[/url]. I reserve the right to yell and make noise for at least a few seconds when I’m mad–anytime I’m mad, even when I stub my toe really, really badly, and I could interpret their sidling up to me as an apology, but I think it’s really a mixture of trying to comfort me in distress and trying to keep a distance! Great post. I know from experience that this method works. I have “trained” several cats to scratch on the scratchers and not on the furniture by giving them treats and pets when they use the scratchers. I wonder if I am inadvertantly rewarding Spyro for running outside. I walk after him and pick him up and take him back inside while telling him how much I love him. The best way to keep Spyro from running outside is to shut him out of the room before I open the door, but that is not always practical. It is amazing how the cats only response well to “good” rewards and will not respond to negative ones. I think I’ve learnt the hard way over the years. None of my cats ever responded well to “the stick” only “the carrot” – not literally I hasten to add. And yes some do learn more quickly than others, just like we humans!! Yes, the humans are slowly learning that they need to reward me for good behavior–and they are learning to ask us to change bad behavior. Our cats only learn all the food and love words. Love Odin!